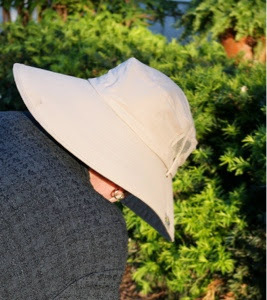 Putting in my Costco geraniums in my new Costco sun hat. The first few times I saw this hat in Costco, I passed, thinking I had plenty of straw hats if I needed one. Then, having shopped Costco three days in a row last week, and having the hats placed right at the front entrance, I succumbed. I realized that these are much more practical than my straw hats. Straw hats are very hard to take on trips. Stuffing a straw hat into an overhead bin on a plane can be the end of the hat, I discovered. The Booneyhats are rated to 100 SPF, lightweight and crushable. Side-vision can be blocked so you don't realize the person sitting to your left, driving the car, is laughing at you. (I saw you, Jacques.) Costco's $14.99 is reasonable compared to competing products. 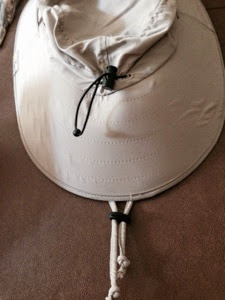 An adjustable cord can adjust the size, and a cord goes under the chin to keep the hat from falling off. ..was smiling at you, mon cheri. Because you're cute.